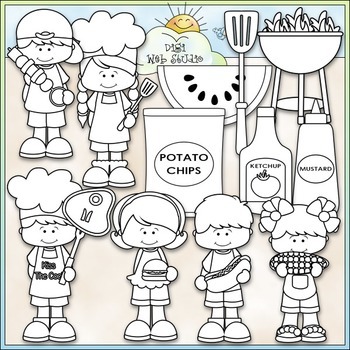 Clip Art and Black and White Download with 19 Color Images and 12 Black and White Images. All images are high quality 300 dpi for beautiful printing results. 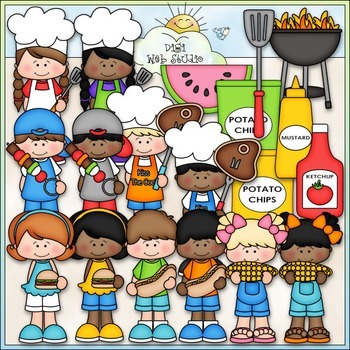 Includes: 1 girl wearing a chef's hat, apron and holding a spatula (2 versions), 1 boy wearing a chef's hat, apron and holding a steak (2 versions), 1 boy with a steak and vegetable kabob (2 versions), 1 girl holding a hamburger on a bun (2 versions), 1 boy holding a hotdog in a bun (2 versions), 1 girl with corn on the cob (2 versions), 1 grill with flames, 2 chips (sour cream and plain), 1 ketchup, 1 mustard, 1 slice of watermelon, 1 spatula.